Last year we welcomed a 3D Makerbot Printer into the office and since then we’ve printed a shoal of sharks and a scurry of squirrel figures. At around the same time, I had the opportunity to work on a few cool projects during my internship. One project in particular soon involved using the 3D printer for purposes other than creating figurines. As the company scaled, it was important to improve the efficiency of processing returned shoes so that the Customer Happiness team can focus on other tasks during the day. The idea of scanning shoes using a NFC reader came about and so I built an interface for this system which ran on a Raspberry Pi. For those unfamiliar to the Raspberry Pi, it is a mini-sized computer which can fit on the palm of your hand! As you might have guessed, this system would require it to be housed in a sturdy but light container. It all sounds simple and straightforward from here - you press the button on the 3D printer and it would start printing, right? Not quite the case (pun intended!). 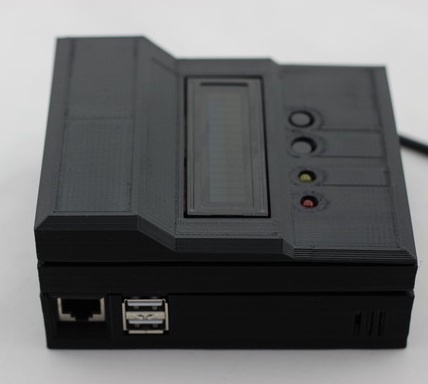 With the help of Parn, our 3D artist, we took an existing Raspberry Pi 3D print design from Thingiverse, where you can share and access a vast collection of 3D designs online, and modified it with our new dimensions to house all the electronic components. Our resulting design consisted of three parts, each which would take approximately 3 hours to print. From our experience we found that placing the 3D printer away from windows and shielding it from the air conditioner with cardboard boxes improved the quality of our prints significantly. We experimented with different print settings to finally achieve an optimum setting that worked well for us - these included increasing the base and extruder temperature, adding more raft support material around complicated overhangs, and adjusting the feedrate and object infill. Albert Einstein once said “Insanity is doing the same thing over and over again and expecting a different results" … it sounds like he knew about 3D printing even before it became possible! Here is a time lapse video of one of our prints. Enjoy! Personally I think 3D printing has the potential to be a huge, game changing industry. Mass customisation is a step in the direction of 3D printing - goods are being produced to order one at a time, so we want to ensure we're keeping abreast of these changes so we can perhaps take advantage of them in our business. Having a 3D printer and experimenting with it is one way of doing this.